On a rocky cliff at the base of Fruska Gora, at the site of today's fortress from ancient times there were military forts, and the latest archaeological studies show that the history of this locality originates more than 200 thousand years ago. Celts lived in this place between 3 and 4 century BC. In Roman times, in the 1st century AD, between Petrovaradin and town today called Sremska Kamenica, there was a fortress Cusum. At the time of the Byzantine Empire in the same place there was a fortress Petricon. In the 8th century, today's Petrovaradin was in franacka state, and from 9 century it was a part of the state of medieval Hungary. The Turks occupied the fort in the year 1526. Turkish fort, after 160 years, (1687. ), had been conquered by the Austrians and the imperial court evaluates a long battle for supremacy in the Danube region. 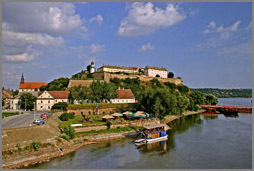 Austria in 1692nd starts construction of the new fortification, now known as Petrovaradin fortress. The construction of the fortress lasted 88 years, until the 1780th year. It was built during the reign of Austrian Emperor Leopold I, Joseph I, Charles IV, Maria Theresa and Joseph II, by the system construction of Marquis Sebastijan Voban (1653-1707. ), French general and architect and writer Voban who never had the opportunity to visit the construction site of the fortress. Under this system were built many fortresses in Europe, and Petrovaradin fortress is the largest and it extends to more than 110 hectares. It is also the most preserved. The particularity of this system are high and steep walls, water moats and channels with movable bridges and control gates. Petrovaradin fortress was built by the plans of Kajzersferda Marsilija and military builders were Vamberg, Gisenbir, Porch, Manet and Schroeder, all prominent names of military architecture of the Austrian Empire. It is particularly important underground fortress on four floors, with 16 kilometers of corridors and resting places as well as a backup supply well in case of a long siege of the fortress. Visiting of the underground galleries is recommended in a company of professional guides of the Museum of Novi Sad. According to one legend, the name is derived from Petrovaradin more words - "Petra" means rock in Latin, "var" is in the Hungarian town, and "din" of the Turkish faith, from which is derived Petrovaradin, the town on the rock firm as faith. Petrovaradins fortress was completely demilitarized in the mid-20th century and proclaimed for a historical monument. It was placed under the protection of the state and assigned to civilian use. 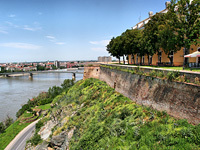 At the fortress there are the Museum and Archive of Novi Sad, hotels and restaurants, studios and galleries of artists, academies of art, astronomical observatory, planetarium and many other facilities. 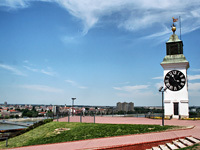 The Clock Tower is a distinctive sign of Petrovaradin fortress and Novi Sad. The diameter of the clock circles on all four sides of the baroque tower is bigger than two meters, and the numbers are written in Roman numerals, such as the rule of Christian churches. Uniqueness of the clock are a big needle that shows hours, and small shows minutes, because for the boatman on the river Danube, the change of guards and military order were significant time, visible from afar. Clock is still operational and rings at the full hours. Monumentality of the Fortress at the rocks and the Danube at the base contributed that many call Petrovaradin fortress "the Gibraltar of the Danube." Copyright © 2010 www.VisitNoviSad.rs by Magelan Corp., All Rights Reserved.